An Address by Walter W. Bristol, the First Principal Presented in December 1939. Although I had been re-elected principal of the Madera Union High School, I decided to make a change; and, with my family, went up to Berkeley and put myself at the disposal of the appointment secretary of my alma mater, the University of California. When I went into her office one morning, she asked me to see a gentleman from Ojai. I was introduced to Sherman D. Thacher. Well, the upshot of the matter was that I decided to go to Ojai, the personality of Mr. Thacher having much to do with my choice. However, I had been in the Ojai Valley many years before and remembered the beautiful environment. We reached Ventura on the morning of July 1, 1909. The “Ojai Bullet” [a railroad engine] was busy shunting beets at Oxnard, so we stole a march on the Southern Pacific [Railroad] and came up the Creek Road in a surrey drawn by two horses, which made the hot, dusty trip in about three hours. We stayed at the Berry Villa, a small hostelry situated back from the Main Street, behind Charlie Gibson’s blacksmith shop [now the site of the post office]. Mrs. Joe Berry, who is still living in the Valley, kept a very nice place. While I was looking over the school situation, Mrs. Bristol had a very amusing time trying to find a place to live. We finally leased a house on Blanche Street, which was being built by Mrs. Bates of Ventura. We spent the rest of the summer in Santa Barbara. The time for opening the school duly arrived. On the second Monday in September 1909 [Sept. 13, 1909], Miss Mabyn Chapman and I met the trustees and twenty-four pupils. Members of the board of trustees were: Sherman D. Thacher, Joseph Hobart, F. H. Sheldon, Dr. B. L. Saeger, and Frank Barrows. The school convened on the second floor of the old grammar school building, which has just been torn down . Principal Edgerton had the grammar school on the ground floor with about 75 pupils. The situation was depressing. The upper floor consisted of two class rooms and two other small rooms, one of which, used for an office, was hot, and in the other in the attic a colony of bats had their hideout and regaled us every day with nauseating odors. But all that was overlooked and in time remedied. Mr. Thacher introduced us to a group of splendid boys and girls, who almost to a man lived up to what our first impressions indicated. But, the principal evidently did not live up to the first impressions of the pupils, for I learned afterward that they thought he, because of his heavy eyebrows and stern expression, was going to be a hard taskmaster. The appointment secretary at Berkeley had sent Miss Mabyn Chapman as assistant to the principal. Miss Chapman remained with the school for five years. She was a remarkably versatile person. She could teach almost any subject usually given in the high school those days with equal facility and made a charming hostess. She lived in a cottage next to ours, and that corner (Blanche and Oak Streets) became the social center of the high school. I speak feelingly about Miss Chapman (now Mrs. Howard Bald) because the successful launching of the high school owes much to her ability and her loyal attitude. We had a successful, happy year in spite of our handicaps. 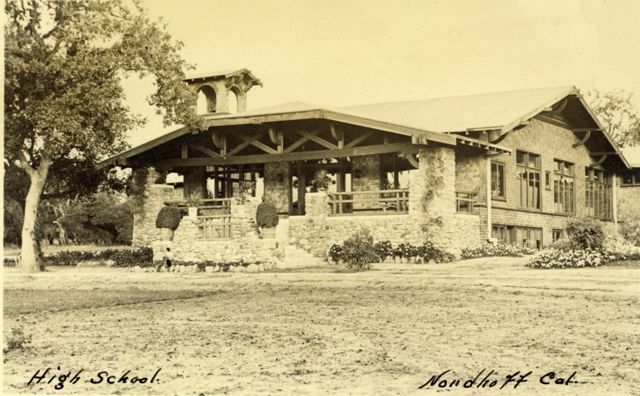 On the evening of the day school closed, I was taken to Ventura by the [Abe] Hobsons in their car to take the train en route to China, Japan and the Philippines; and so close was my schedule of travel that, on returning, I arrived in Ojai the day before school opened in the fall of 1910. Mrs. Ruth Forsyth of Gilroy was added to the faculty the second year. She also remained five years and was a splendid teacher. Miss Chapman and Miss Forsyth became fast friends, and I could fill a page or two recounting amusing and sometimes strenuous adventures. The distinctive feature of the second year of the school was the introduction of an extensive course of lectures and entertainments. The principal gave a series of illustrated talks about his trip to the Orient. Principal Lee of Oxnard High School gave an illustrated lecture on the Shakespeare country. Mrs. Albert Barrows gave a talk on the Philippines, and we had a concert or two. In lighting the projector, we had to use acetylene gas; and it was a toss up as to whether it would last through the lecture. The girls that year organized a basketball team and met Santa Barbara. The boys did some track stunts, with Bob Dennison frequently coaching them. Tennis was, of course, a favorite sport. A play of that year stands out in my mind. It was “Op O’ My Thumb,” in which Margaret Bald distinguished in the leading role. I recall that Mrs. Margaret Clark Hunt furnished horses one Saturday for the whole school. We went to Topa Topa’s summit. Through the kind offices of some of the boys, I was pulled out of the saddle when the interesting trip was over. I did not go to church the next day. During the second year of the school, I urged, much to the evident consternation of the trustees, the necessity of having larger quarters and more equipment. Being convinced that such was the case, the trustees began the discussion of a site for the proposed new building. According to law, if all the trustees of a school unite on a site, it may be carried without a vote of the people concerned. Four of the trustees, from the first, favored a site about three-quarters of a mile west of the village [then known as Nordhoff]. One member stuck to his guns for a site east of town on what is now known as the Waite Tract. The whole matter was warmly discussed on the street and in the press. At last, the day of the election arrived and such excitement. The west side carried the day by 40 votes. Bonds for $20,000 were voted, and in the summer of 1911 the buildings were rushed to completion on ten acres of land, half of which was given to the district by Waldo Forster. In September 1911, the first sessions in the new but somewhat incomplete plant began. Miss Helen F. Dorrance and Miss Ida Belle Lamb were added to the faculty. John Timms was the janitor and gardener and served for many years. Under the direction of Miss Lamb (now Mrs. R. S. Dennison), the Girl’s Glee Club became a prominent and most delightful feature of the school. Blaisdell of Pomona College was the speaker of the evening. In the spring of 1912, Miss Lamb presented her Girl’s Glee Club in its first concert. It was most ambitious for a small school (about 40 [pupils] now] and very successful. The stage setting won great applause by the large audience and was the work mainly of Miss Nina Soule and Mrs. [Olive] Bristol. The first part of the program was the Glee Club. The second part was Denza’s cantata “The Garden of Flowers,” starring Carolyn Wilson. Miss Chapman had organized a Deutscher Ziken (German club), and on May 10th gave a concert and play in German. The play presented that year was “The Elopement of Ellen,” which included in the cast Howard Bald, Nina Freeman, Thornton Wilson, Abbie Cota, and Tom Gibson. The first class (1912) to graduate was: Grace Hobson (Valedictorian), Carolyn Wilson (Salutatorian), Nina Freeman, Ethel Freeman, Edna Leslie, Abbie Cota and Levi Bray. The annual, which we named Topa Topa made its first appearance at the close of the 1912-1913 session. Carolyn Wilson was editor and Howard Bald business manager. At the opening of school in 1912, automobiles made their first appearance in the faculty. Miss Forsyth drove down from Gilroy in a Reo, and Miss Dorrance appeared in some kind of car. The principal did not have such a luxury until 1917. Physical Education was started in that year . Miss Chapman and Rev. W. H. Macpherson taught the various stunts in this line and gave public exhibitions from time to time. There were two major plays in 1912-13. “The Lady of Lyons,” a five-act play, starred Thornton Wilson and Helen Baker. The play was directed by Miss Dorrance, and the rather elaborate costumes were designed and made by Miss Chapman. It was a memorable show. Also, “A Scrap of Paper,” starring Thornton Wilson and Dorotha Clark [was performed], with a part for each member of the class. Another excellent program was presented by the Girl’s Glee Club, under Miss Ida Lamb’s direction, in the spring of 1913. The class of 1913 was: Margaret Bald, Fred Burnell, Howard Bald, Ruby Watkins, Mertie Jackson, Mary Freeman, Elma Morris, Thornton Wilson, Dorotha Clark, Jennie Friend, Maxwell Allen, and Rose Goodman. Howard Bald was ill on commencement night, which circumstance gave the principal a chance to commend his splendid services to the school. Owing to the well-nigh perfect record at the University of California of Grace Hobson, professor Thomas of the University school examination staff, reported to us that the N. U. H. S. stood first in the state in scholarship among the freshmen at the close of the first semester on 1912-13. Carolyn Wilson that same year, at the San Jose Normal School, won a prize of $150 for good work in her studies and for participation in school activities. School opened early in September, as usual, in 1913. In the fall of that year, the Alumni Association was formed, and for several years we held annual conferences. The graduates living near attended, and many who were away sent letters. The Girl’s Glee Club gave a concert on December 12th, and Miss Agnes Lord assisted with her violin. It was Miss Lamb’s last concert, for she married R. S. Dennison soon after. Miss Dorrance continued the girl’s chorus work. The play that fall was Kendrick Bang’s “The Worsted Man,” a semi-musical comedy, starring Harry Stoker and Charlotte Treadway. The month of February, 1914, was noted for a great storm. Rain poured down for 54 hours with scarcely a let-up. School was closed for three or more days. In June “The Private Tutor” was presented by the senior class, consisting of Tom Gibson, Clifford Watkins, Irma Busch, Julia Lescher, Elizabeth Kincher and Jack Clark. Tom Gibson, a remarkable lad, was the Valedictorian, his subject being “The Marvels of Modern Surgery.” He was a student who knew what he wanted to do and stuck with it. Tom Gibson is now a most successful surgeon in San Francisco. The Topa Topa was edited by Tom Gibson and dedicated to the principal. In the fall of 1914, Alexander Barnes was added to the corps of teachers. Mr. and Mrs. Barnes made their influence felt in the school and community, especially in the field of music. The play that fall was “Her Own Way,” by Clyde Fitch, starring Helen Baker and John Dunshee. It was cleverly done. Instead of the usual concert in the spring, Mr. Barnes put on a very successful minstrel show, using fifteen boys in the circle. This entertainment was followed in May by a play called “All of a Sudden, Peggy,” which was put on by the senior class. In the spring of 1915, the school decided to accept the invitation of the Southern California High School Chemistry Society to compete along with other Southern California high schools in a written examination relating to chemistry. We sent Helen Baker and Ruth Garland to Los Angeles to represent us. In due course, we were notified that our team had won the coveted distinction of having the highest average and winning the cup. On October 22, 1915, at a luncheon at the University Club in Los Angeles, there were assembled the Garlands, the Bakers, the Principal, and Miss Forsyth, who taught the team and who came over from Pasadena to be present. In the presence of about one hundred scientists and science teachers, our girls were presented with the cup, and a proud day it was for the school. The commencement exercises of the class of 1915 were rather unique. On the stage there was a demonstration of classroom work in Mathematics, chemistry, and botany. A lesson in trigonometry was given by Charlotte Busch, botany by Marguerite Mallory, geometry by Evelyn Herbert, and chemistry by Fred Sheldon and Ruth Kincher. This program constituted the first part of the evening exercises. The second part conformed to the usual type of commencement proceedings, in which Helen Baker was the Valedictorian. But old thou never wert. Thou dost so make God thy life. To spare thy soul to abide alert. There glows through thee spirit so divine. To know thee is to love, adore. Sixty-one students registered in the fall of 1915. Miss Alice Fowler took Miss Dorrance’s place in the faculty. Miss Forsyth gave place to Miss Hope Jordan. The fall play was “The Colonel’s Maid,” starring John Dunshee and Reba Taylor. The day came, and we went over the whole subject on the grounds. He said finally, “You seem to know just what you want. Tell your trustees to get the same architect who planned your school and have him plan, construct, and equip one building for the boys and one for the girls and send the bill to me.” I am sure I walked on air the rest of the day. The trustees lost no time in getting the buildings up and the equipment put in place, so that they could be in use in the fall of 1916. The week of May 15th was high school week at the Isis Theater [the town’s motion picture theater], a part of the proceeds to be given to the school by the proprietor for athletics and the Topa Topa. Owing to the illness of the English teacher, we did not have a play in the summer of 1916. The class of 1916 was composed of Ruth Garland, Elmer Freeman, John Dunshee, Hazel Parmenter, and Harold Neville. At the commencement exercises, Ruth Garland was the Valedictorian, and Dr. Alter W. Palmer of Oakland was the speaker of the evening. We dedicate this, our annual. The school opened in September, 1916, with great expectations. The two new buildings were ready and splendidly equipped. Seventy-two pupils were registered. We began the year with the following new teachers: Lucetta Kenneberger, Margaret Alltucker, Francis Mowry, and Kenneth Rich. Alexander Barnes held over. Miss Mowry had the domestic science and art departments and Mr. Rich the manual training. A Spanish Club of twenty-eight was organized. In February, 1917, Miss Kellenbarger ambitiously put on Sheridan’s “The Rivals,” starring Eldred Miller and Doliver Church. Mrs. Wilda Wilson Church helped with the play and other times gave us readings and interesting talks. The new buildings were dedicated in March . The speakers were Dr. Scherer of the California Polytechnic [Institute] in Pasadena; Mr. Pratt; Sherman D. Thacher, the president of the board of trustees; Felton Taylor, president of the student body; and the principal. We did not compete for the chemistry cup in 1916, for the reason that chemistry was given out every other year. But in the spring of 1917, we prepared to enter the competition again, with Miss Alltucker as instructor. The team we sent to Los Angeles was composed of Cecil Crowe, Reba Taylor, and Eldred Miller. The senior play was given on June 5th. It was staged out of doors and coached by Miss Kellenbarger, who, by the way, was an exceptional English teacher. The play was “Hiawatha.” Felton Taylor was Hiawatha, and Esther Waite was Nokomis. William Mallory made his debut as an actor in the part of the child Hiawatha. On Saturday, June 9th, there descended upon the Ojai Valley the disastrous fire of 1917. I had been at a meeting of the County Board of Education that day and drove home about two o’clock. Esther [his eleven-year-old daughter] was with me, and we spoke about the smoke rising over the range toward the north, but did not consider it serious. John Timms and I patrolled the school grounds; but when the hot wind swept the flames along the tops of the oaks toward the school property, we were helpless. The tennis court saved the domestic science building and the main buildings, but the manual training building was burned to the ground and the expensive equipment ruined. Mr. Pratt wired to have the building rebuilt at his expense. Those were sad, trying days. We had no lights in the auditorium, so simple commencement exercises were held in the old Presbyterian church. The class was Cecil Crowe, who entered high school at eleven years of age and was one of the brainiest boys I knew; Felton Taylor; Florence Schurman; Dewitt Menefee; George Jackson; Esther Waite, and Bennie Houk. Cecil Crowe was Valedictorian. DeWitt Menefee edited the Topa Topa. The great fire destroyed our home and all there was in it, also, Mrs. Bristol’s School building and equipment. Mr. Ladd telegraphed from Portland, Oregon, that we could have his house for the summer, which we gratefully accepted. My wife and I were at the crossroads. What should we do? Seated on the east veranda one afternoon, we discussed the situation. Mrs. Bristol had made a success of her [private] school and loved it; but rebuilding would be a trial and expensive, especially if she took a few girls to board, which she importuned to do. I was inclined to take advantage of the break and try for another school. It was the lowest point in our depression; for, turning to some unopened mail on a table nearby, I read a letter from the Southern California Chemical Society saying that our team had again won the contest in chemistry. That settled it. I couldn’t desert a school that had won an intelligence test in competition with twenty-two schools and eighty-four students. In October, 1917, the presentation took place at the University Club in Los Angeles. Reba Taylor received the cup for the school, which this time was ours to keep. The opening of school in 1917 was quite depressing. The enrollment had decreased considerably. The shadow of the great fire was till over the community. The war spirit [World War I] was such that the boys wanted military drill, which to a limited extent was allowed them. We had in the school that fall a Jewish boy, whose family came here for the winter. He had some training in military tactics and undertook to command the boys under general direction of Mr. Rich. Miss Rosina Caldwell took Mr. Barnes place in the faculty. The reconstructed manual training building was ready for the opening of school. There was a move to organize a Y. M. C. A. in Ojai. The school gave a play written by Kate Douglas Wiggins entitled “The Birds”. . . . It was given in the old Presbyterian church. Early in 1918, automobile sheds were constructed by the boys of the Manual Training Department. The winter play was “Green Stockings,” starring Florence Thompson and George Busch. The spring play, coached by Miss Kellenbarger, was “In Cleon’s Garden,” a Greek play. It was given out of doors. Arthur Waite and Eldred Miller had prominent parts. A turtle and parrot were in the cast. Special lighting effects were devised by the students, and tiers of raised seats were provided for the audience. The class of 1918 consisted of Faith Van Curen, Eldred Miller, Reba Taylor, Ruth Parmenter, Charles Parsons, Dwight Van Fleet, Winifred Gibson and George Busch. Reba Taylor was the Valedictorian. On account of the high cost of materials, Topa Topa was not published that year. At the opening of the school in 1918, Miss Ruth Garner of Lodi took Miss Alltucker’s place; and A. W. Muse took Mr. Rich’s work. Both of these were remarkably fine persons and teachers, and we hated to lose them. Miss Elizabeth Taff, now Mrs. Harry Dennison, took Miss Mowry’s work in the Domestic Science Department. We had just got well-started with the work of the year, when the Spanish Flu struck the town; and the school was closed for seven weeks. The Manual Training Department put on a play in April, 1919, called “Under the Laurels,” under the direction of Mr. Muse; which, as I remember it now, was not up to our usual standard of plays. The class of 1919 graduated on the evening of June 20, and [was] comprised [of] the following students: Elsie Gibson, Dorothy Yant, Harriet Semro, Margaret Macleod, Jessie Drown, Margaret Hunt, Melba Miller, Fern Watkins, and Arthur Waite. Dorothy Yant was the Valedictorian. Very early in our history, the teachers and students agreed that in athletics we would undertake only such sports as we could with credit to ourselves. Consequently, we left out track and football and concentrated on tennis, baseball, and basketball. In 1917, we were first in the county in tennis, second in baseball, and second in basketball. I shall never forget the pennant game of baseball played with Fillmore on our field in the spring of 1917. Bennie Houk, reputed to be the best pitcher in the county, pitched a fine game through eight innings; and our school was ahead. In the ninth, he let in enough runs to beat us. The excitement was too much for him, perhaps. We were good losers, nonetheless. The nostalgic effect of the game was felt in the school for some time. I remember Mrs. Drown gave the school a scoreboard, and Mr. and Mrs. W. E. Houk gave us a handsome blue and gold megaphone. In the years 1912 and 1919, inclusive, we graduated sixty pupils. Of these, 35 went to higher schools. Eighty-two children, so far as we have been able to learn, have been born to these graduates, some of whom have also graduated from the local school. With this report of the first decade of the Nordhoff Union High School, I bring to a close what seems to me to be romantic years. 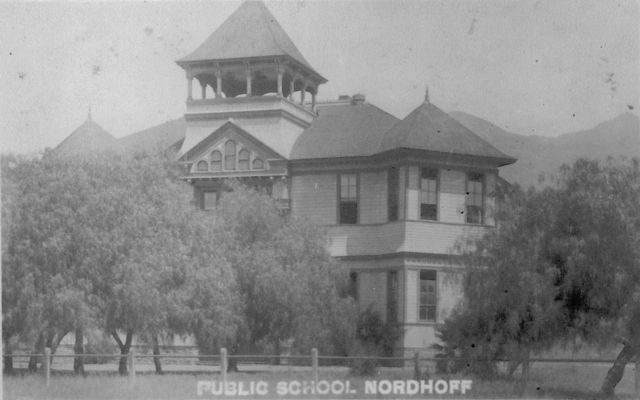 I was amazed to read about the early times of Nordhoff since I myself am a 1964 graduate. My grandmother, Edna Leslie (Grout), was in the first graduating class!